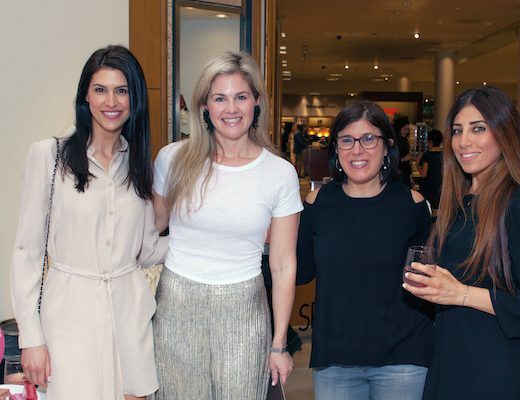 Hair/Makeup: Peter Dallas from Arid Beauty and Blow Dry Bar. 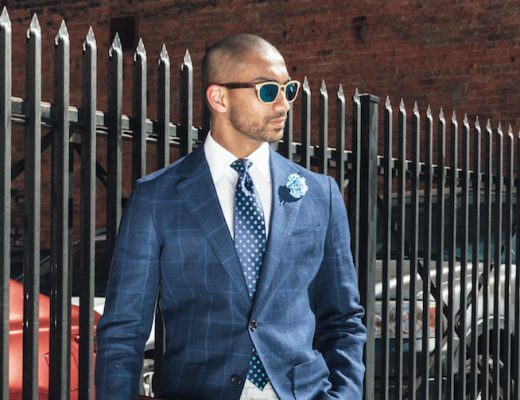 Veesh is wearing Sharklion sunglasses, $985, Optik Birmingham; his own dark gray blazer (shop similar); Detroit Lions NFC Steel tee, $34, Rag & Bone rock fit denim pants, $210, both from Caruso Caruso, Birmingham; and his own shoes. Marina is wearing sunglasses, $18, a Lions black pullover hoodie, $68, Rag & Bone Dre-Capri cropped denims, $275, all from Caruso Caruso; Sorial Belle saddle bag, $175, Sam Edelman Leya Velvet Pom shoes, $100, both from Sundance Shoes, Birmingham. 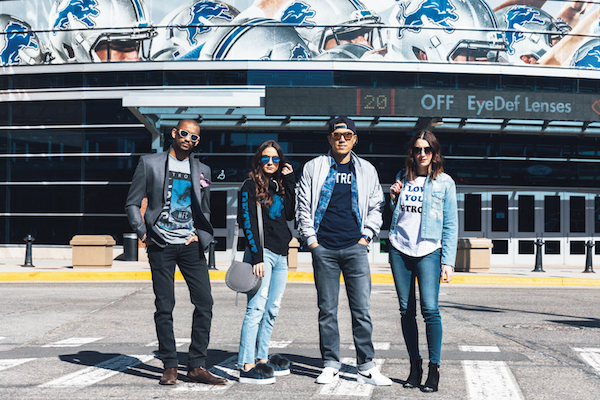 Seoung is wearing a Detroit baseball hat, $34.99, from Caruso Caruso; Sharklion sunglasses, $985, online or Optik Birmingham; Detroit Arch tee, $34, 7 Diamonds woven button-down shirt, $69, EPTM lightweight bomber jacket, $54, Citizens of Humanity Denim jeans, $210, all from Caruso Caruso; and his own Nike sneakers. Liz is wearing stylist’s sunglasses, I Love You Detroit baseball tee, $42, from Caruso Caruso; Mother Denim cropped denim button-down shirt, $198, Frame Le High skinny jeans, $230, both from Guys N Gals, West Bloomfield; and Jeffrey Campbell Cromwell black suede booties, $175, from Sundance Shoes, Birmingham. 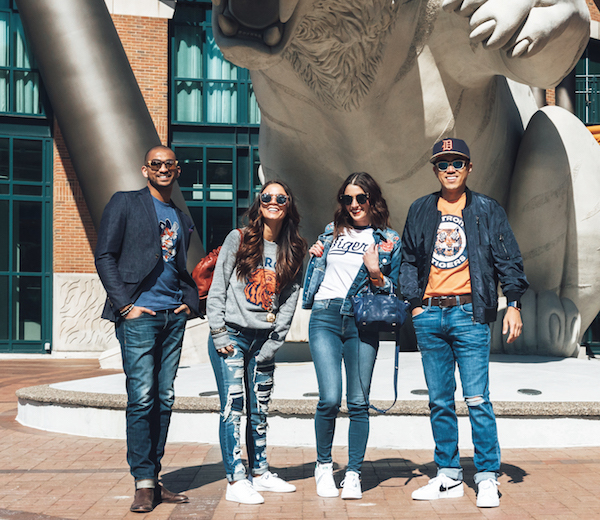 Veesh is wearing his own denim blazer; Detroit Tigers T-shirt, $42, and Rag & Bone Slim Rock denim, $198, from Caruso Caruso, Birmingham; SharkLion Russell sunglasses, $985, at Optik Birmingham. 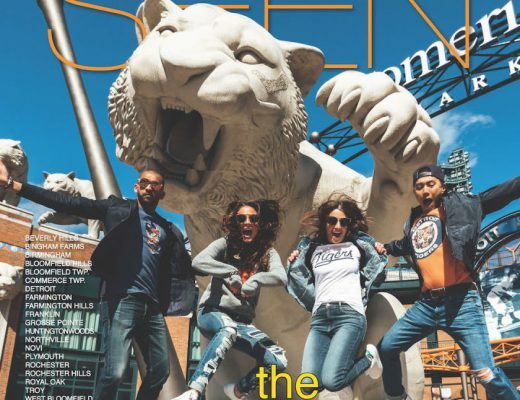 Marina is wearing SMPLFD Detroit Tigers sweatshirt, $53.99, Ella Designs Chain Link Bracelet, $75, available at Sundance Shoes, Birmingham; Rag & Bone Ada Brigade jeans, $325, and sunglasses from Caruso Caruso; and her own Nike sneakers. Liz is wearing SMPLFD Tigers Baseball tee, $26.99, Blank NYC Denim embroidered jacket, $148, Frame Denim Le High skinny jean, $230, From Guys N Gals, West Bloomfield, sunglasses from Caruso Caruso and her own Adidas sneakers. 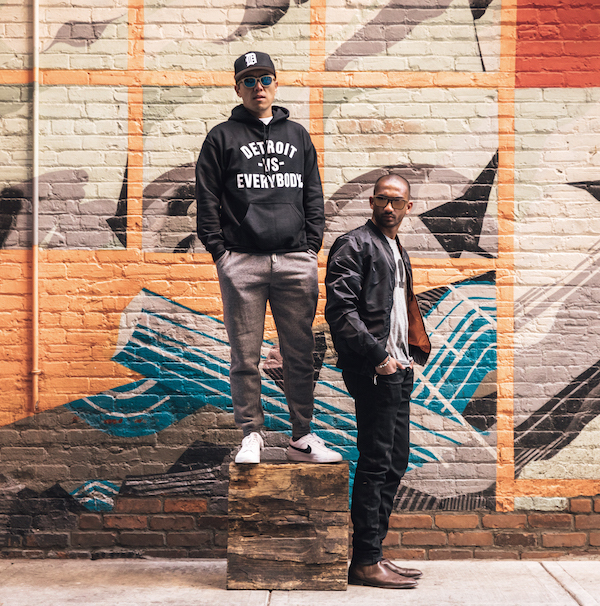 Seoung is wearing Wright & Ditson Detroit Tigers tee, $30, Blank NYC navy jacket, $148, Shinola Detroit Essex Brown Belt, $125, Detroit baseball hat, all from Caruso Caruso; and his own Nike sneakers. 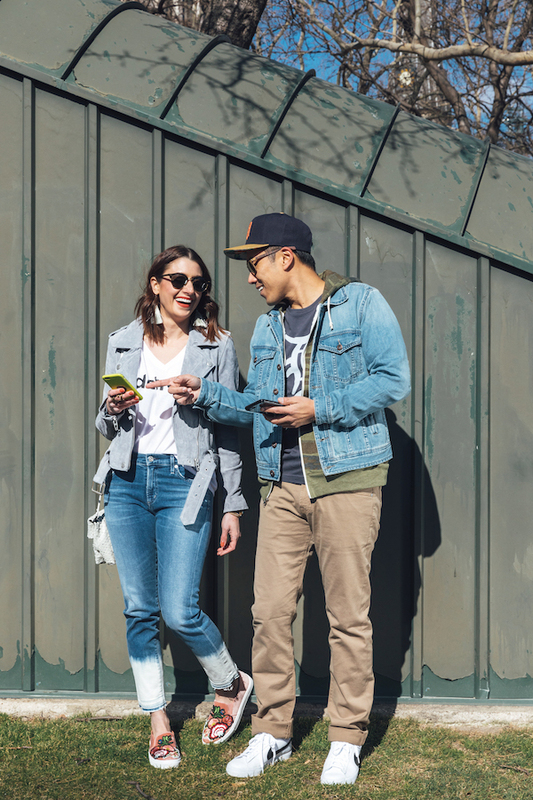 Liz is wearing her own sunglasses; tassel earrings, $48, from Anthropologie, Birmingham; Detroit T-shirt $25, from Kiloh & Co., kilohandco.com; Blank NYC suede jacket, $198, from Guys N Gals, West Bloomfield; Citizens of Humanity Agnes Cropped jeans, $258, from Caruso Caruso, Birmingham; Daniella Lehavi gray purse, $290, from Guys N Gals; cuff ring, $800, from Orleans and Winder, Detroit; Velvet Rose embroidered slip-on sneakers, $69, from Sundance Shoes, Birmingham. Seoung is wearing Wright & Detroit Tigers D Vintage crew, $30, Camo Rocky hoodie fleece, $64, Blank Light denim jacket, $118, AG Matchbox Beachwood pants, $178, all from Caruso Caruso; and his own shoes. Veesh is wearing Retro Brand Detroit Motor City tee, $34, Rag & Bone slim rock fit denims, $198, Blank NYC distressed denim jacket, $128, all from Caruso Caruso; Sharklion sunglasses, $985, from Optik Birmingham; and his own bracelets and shoes. Marina is wearing stylist’s Pucci sunglasses; black lariat/choker with pearls necklace, $69, from Sundance Shoes; Le Detroit gray tee, $34, from Caruso Caruso; Monarc 1 leather vest, $1,125, from Orleans and Winder; Frame Le Color crop jeans, $184, from Caruso Caruso; gray leather fringe cross body bag, $169, and black booties, $149, both from Sundance Shoes. 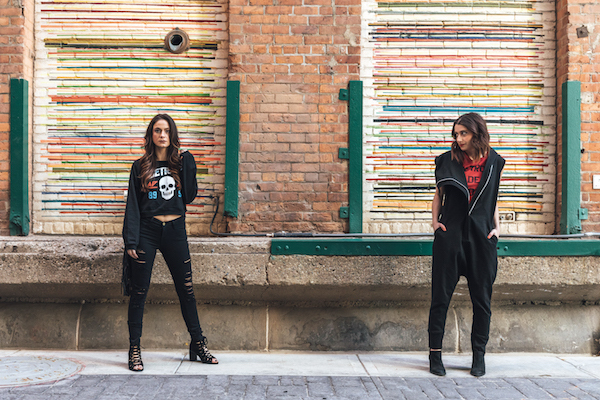 Marina is wearing SMPLFD Detroit Bad Boys cropped crewneck, $41.99, from SMPLFD.com; Frame Le Color Ripped Film Noir denim, $198, from Caruso Caruso, Birmingham; Jeffrey Campbell Corwin open-toe bootie, $129, black fringe leather satchel, $149, both from Sundance Shoes, Birmingham. Liz is wearing Detroit Made Me Do It red muscle tank, $34, from Caruso Caruso: Monarc 1 hooded jumpsuit, $487, from Orleans and Winder, Detroit, and black booties, $149, from Sundance Shoes, Birmingham. Seoung is wearing Alternative Apparel Eco Fleece Dodge Ball pants, $54, Detroit vs. Everybody dye original hoodie, $55, Detroit hat, $34.99, all from Caruso Caruso; and Sharklion sunglasses, $985, available at Optik Birmingham. 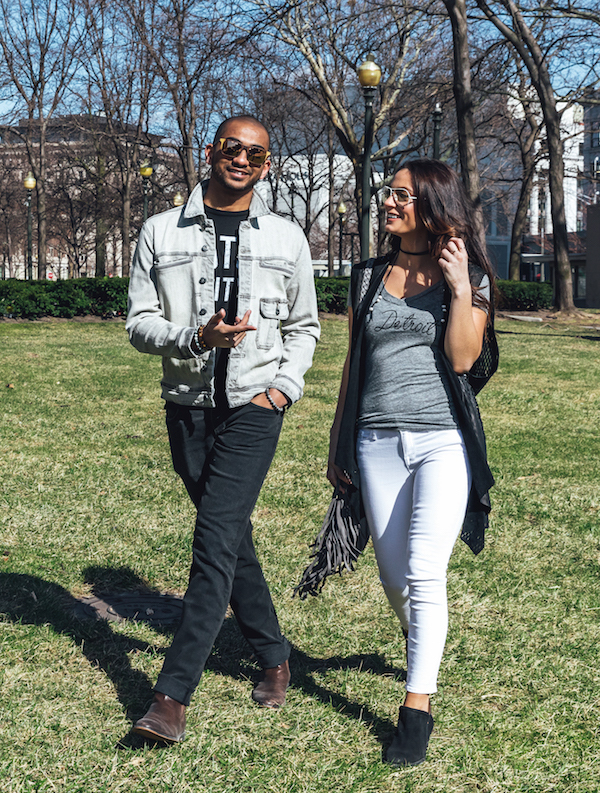 Veesh is wearing Retro Brand 313 Detroit T-shirt, $34, Black bomber jacket, $148, Rag & Bone skinny black denim, $195, all from Caruso Caruso; Sharklion sunglasses, $985, from Optik Birmingham; and his own shoes.